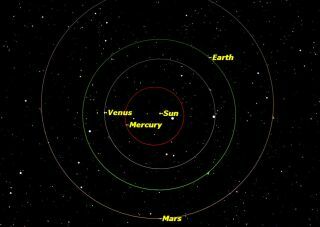 The orbits of the four inner planets: Mercury, Venus, Earth, and Mars. On Jan. 2, 2013, the Earth is at perihelion, its closest point to the sun of the year. If the sun looks a little larger than usual today, you're not seeing things. Today (Jan. 2) marks the time when the Earth is at perihelion, the point in its orbit at which it is closest to the sun. During perihelion, the Earth is exactly 91,402,560 miles (147,098,161 kilometers) from the sun.In actuality, you most likely can't see any difference between the apparent size of the sun today and its appearance at aphelion (when the Earth will be farthest from the star).The difference is only 3.4 percent, too small to be detected with the naked eye. Only Venus and Neptune have more circular orbits than the Earth. On the other hand, if you look at the diagram of the orbits of the four inner planets accompanying this story, you may easily see that Mercury and Mars have orbits which are seriously eccentric. Astronomers use the term "eccentric" in its original mathematical sense, meaning "away from the center." A perfect circle has an eccentricity of 0. A straight line would have an eccentricity of 1. Everything else in between is an oval of some kind. Looking at the diagram, the orbits of Earth and Venus look almost perfectly circular, while that of Mars is slightly closer to the sun towards the bottom. Mercury's orbit is very much closer to the sun on the right. If you look closely, there is a little tick mark on the orbits to indicate where perihelion lies. Don't confuse this mark with the little wedges which denote the orbital nodes, the points where the orbits cross the plane of the ecliptic. The Earth appears right next to the tick mark on its orbit marking perihelion in the image. This perihelion effect is very minor compared to the effects of the tilt of our planet's axis. During December in the Northern Hemisphere, the North Pole is tilted away from the sun so that we receive less sunlight every day. The only effect of perihelion is that the winters in the Northern Hemisphere are very slightly milder than the winters in the southern hemisphere at the equivalent latitudes. Not as many people live as close to the South Pole as do close to the North Pole, so humanity isn't affected much. So enjoy that "big" January sun, and look forward to the longer days to come as Earth moves around its orbit to the point where we really receive more sun and spring arrives.